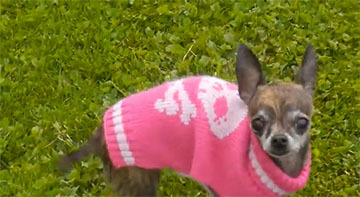 Went to the park today with Mom and Dad, wearing my favorite pink sweater. Mom shot video! Check me out at my favorite park in Carcassonne: Kiara at Bellevue Park. Mom and Dad have been after me to write a blog post. Until now, I didn’t know what I should write about. But today I was thinking about all the nice people I’ve met in France. THE VET | Dr. Broy, he’s very nice man, speaks a little English but knows his stuff about dogs. He was the doctor who made me feel so much better when I got sick. He is a neurologist and Mom really likes him as my primary doctor, so we’ll probably be seeing more of him. And he has a nice accent too! Plus, he loves me — major points for Dr. Broy. THE AUSSIES | Last night I met a couple from Australia. At first Dad thought they were from Great Britain, but only because we rarely hear English and usually when we do they are from Great Britain. [Most of the local people in Carcassonne think we’re from Great Britain too — right, because I look like I come from a rainy climate, duh!] The lady couldn’t wait to meet me and liked that I was wearing my pink sparkly necklace, she smelled nice. The man couldn’t believe that I only weigh one kilo and told my parents that I was beautiful. They loved me! Australians must be very smart people. THE CANADIANS | A couple of days ago we were walking across the Pont Vieux and I was not on my leash [Mom lets me walk without it if I’m very good, don’t get in anybody’s way and come when I’m called — which I always do]. About two-thirds of the way across I saw three people sitting on the side of bridge and taking pictures of each other. Two ladies and a man. I wanted to meet the lady with the short brown hair, so I wiggled my tail at Mommy and she said I could “go say hi” — it’s her code words to let me know that it’s alright if I approach strangers. The lady with the short hair and the lady with the grey hair did that squeal that some ladies do that really makes my ears happy. The man was talking with Daddy about stuff and I got cuddles from the lady with the short hair. Canadians must really be dog people, both of the ladies from Canada made happy, happy noises — which I like. When we were saying goodbye and telling them to have a nice trip, the lady with the short hair said “Oh she’s just SO cute” and I could tell that the nice people from Canada loved me! THE JAPANESE | Our second week in France Mom and I ran into a group of tourists from Japan, about 12 people. It was rainy that day and they all had such bright colored umbrellas it looked like a carnival. They were waiting to cross the street at the light, but when I approached the corner from the grassy area one of the ladies spotted me and squealed. (I just love that!) She knelt down and Mom said “go say hi” so I ran over and put my paws on her knee, she looked at Mom with the biggest smile in the whole world. She asked Mom if she could take my picture and Mom said sure! So I got my picture taken with the nice lady from Japan, then with her and her boyfriend, then with two more of her friends! She was talking to me in a sing-songy language that I really liked, it sounded very pretty. I could tell that her and her friends, they definitely loved me! Very nice people must live in Japan. THE FRENCH | Ever since my first walk in Gambetta Square French people have stopped to talk to Mom and Dad and to touch my head or scratch under my chin. Some have just scooped me right out of Mom’s hands and asked in French (which Mommy doesn’t really know) if they could show me to their friends. Mom and Dad usually say yes, except for when it’s a child — they worry that I’ll get loved on too hard and get hurt. I really like the people in France though — all the sounds they make are happy, happy sounds. Did you know that in France dogs are welcome to come into restaurants, stores and events like market day, people from France are real dog lovers, they treat their dogs like people — we have not seen one dog that was sick or injured or even a stray dog. And the French people are curious about me, they always want to know what kind of dog I am, how much I weight, how old I am and . . . they kiss! I know the French people really love me, because the ladies, the little girls and even the little boys always kiss me and all French people make the happy, happy noises that I like. I think that French people are very, very nice and they are good dog people. Dad says I’m in International Diva, I don’t really know what that means, but I really do like meeting people from all over the world. It’s kinda cool and really fun, but so far everybody loves me! Maybe Dad should start carrying a guest book so that people can sign it and say where they are from, kinda like a scrapbook.